Posted: 2006.12.14(Thu)11:37 Post subject: The Aquahobby Webcomic! Ever since the idea came up elsewhere in the forum, DF Bobo and I have been working on starting up a weekly webcomic for you guys! 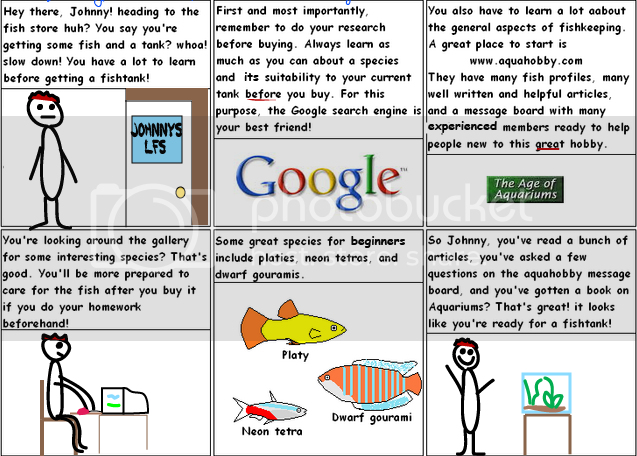 At first it was meant to be just collection of jokes, but it eventually came out being more of a guide to new fishkeepers, with some humour thrown in. Hopefully, we'll have a new one every week, we'll see. Kudos to DF for the great fish pictures! I did Johnny, isn't he cute? I like it. Hope to see more. for those who read this, leave a comment about our comic! we'd like constructive criticism to know what we can do better. I think it's pretty good and could serve as a gentle intro to the problems encountered by first timers. Nice job. Can you make Johnny not look so much like Marcos? I like the idea...it looks like fun. I didn't know that marcos had red hair.... oh well, I don't draw Johnny. for those who are observant, here's a little challenge. I'm lazy so I like to recycle pictures. guess how much of the stuff in the second comic was drawn and how much was taken from old drawings. I too am guilty of cutting and pasting. Glad everyone likes it so far! I love it! Hope you'll keep working on em and keep sharing em. Should have one out by tomorrow- it just needs to get fishified.